“Sometimes [crystals] jump from my hand or I drop another crystal on them accidentally, etc. I am brand new at this and don’t know how to proceed. Thank you” – K. S.
If you live with crystals for long, there will unfortunately come a day when breakage occurs. Either by dropping them to the floor or onto a hard surface, or even as in the case mentioned above, dropping something on them or clanking them against one another. It happens. It’s sad and usually heartbreaking for me, especially if it is a favorite crystal. We never want to cause harm or injury to those we love. The positive note: there is almost always a lesson to be learned in the breaking. Many times, a “flawless” crystal will be dropped or dinged while in the care of a person, and the person usually feels terrible about this, that it is somehow their fault and that they have “ruined” an otherwise “perfect” crystal. The message I have received from the Crystal People over and over again, is that more often than not, the crystal has chosen to be damaged in order to assist the person with a lesson on self love and acceptance (and forgiveness!). A further bit of proof of this is that not every crystal which is dropped breaks, and not every crystal which is broken has been dropped. What does this mean? It is important to note that Empathic crystals bring out compassionate feelings in us. 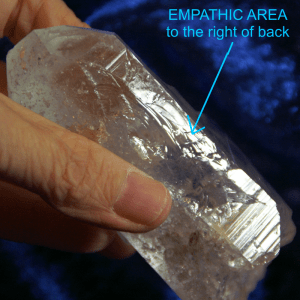 (Empathic crystals are crystals which are chipped, broken or damaged.) When we see a chipped or damaged crystal, we tend to show it love. Even more so if the “damage” is caused by our own hand. The crystal picks up this empathy and amplifies it. The empathy continues from there on! Remember, a crystal will encounter many people during its lifespan. Each person that expresses compassion for the damage on the crystal increases the empathetic energy of the crystal. It is a cycle that builds and repeats. Therefore, if the unfortunate happens and you do break a favorite crystal, work with this special empathic energy. 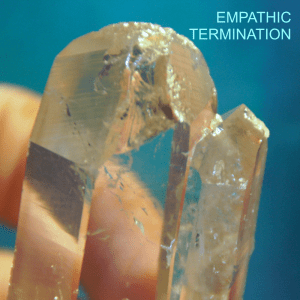 In any circumstance in which you need to bring compassion into the mix, you might work with an Empathic (chipped, broken or damaged) crystal. If it is a crystal which has broken in your care, meditate on the type of crystal, the circumstances, and how it makes you feel that this happened. Do you need to practice forgiveness of self? Come to terms with imperfections? Learn to accept perceived flaws? I usually find more often than not that the compassion and forgiveness needed is toward self. Again, especially if the “damage” is caused by you. I tend to get hyper judgmental and hard on myself in these situations and it is hard to forgive myself! I find it is easy to feel compassion for and to forgive others for their mistakes, but we are much harder on ourselves. We expect to be perfect or not “flawed”. 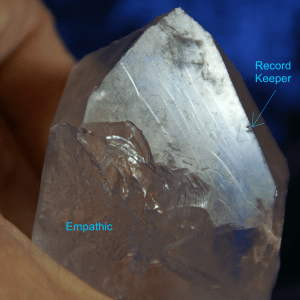 If we work with an Empathic crystal, we can see how much we still love this crystal, not simply in spite of its damage, but a lot of times, because of it. We are able to see what this crystal has gone through in its lifetime and still it perseveres. The crystal doesn’t hold any ill will toward us for its change in shape and or resulting flaws, chips or dings. It still just as happily receives and returns our love and acceptance. It is still beautiful and worthy. It isn’t sad or angry at us for “breaking” it, nor should we be angry at ourselves! In the creation of the damage, the Empathic (chipped, broken or damaged) crystal helps to remind us to be forgiving of our mistakes. In the actual damage, it reminds us to apply the same feelings of love, acceptance and compassion for our own perceived “flaws”. So! Don’t feel all is lost if you damage a favored crystal, see the lesson in it, forgive yourself, love your crystal MORE and move on! Genn John has been acting as the legs for the Crystal People as the Keeper at Arkansas Crystal Works, an internet-based source for crystals and crystal knowledge, since 1995. Having accepted the honor to be their voice as well, she is the author of Understanding The Crystal People: A Handbook for Lightworkers; a crystal reference book for people who desire to fully understand their connection to the crystal kingdom and who wish to enhance their working knowledge of these majestic beings. Genn has also published a 4 part series of coloring books which are a useful tool for anyone with an interest in learning the anatomical structures of quartz crystals. It features precise, extraordinary hand-drawn designs crafted especially for easy coloring and interactive study. Find the store and more at http://www.arkansascrystalworks.com, or her blog at http://www.crystalgenn.com. To connect: email – genn@arkansascrystalworks.com, facebook – https://www.facebook.com/ArkansasCrystalWorks, Instagram – gennjohn or Twitter @GennJohn.